The number of global M&A deals is forecast to increase by 2 percent year-over-year (YOY) during the first six months of 2019, according to a new report by Intralinks. 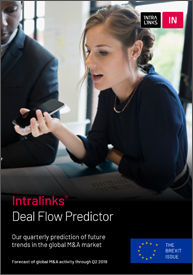 In its ‘2019 Deal Flow Predictor’, Intralinks highlights an uptick in M&A activity in North America (NA), Asia-Pacific (APAC) and in Europe, with the strongest growth in deal announcements expected to come from the real estate, energy & power and materials sectors. Among the report’s key findings for H1 2019: (i) in NA, the number of M&A deals is forecast to increase by around 5 percent; (ii) in APAC, the number of deals is expected to increase by around 4 percent; and (iii) among the five largest European economies, France, Italy, Germany and the UK are expected to show higher levels of M&A announcements, with Spain expected to be flat. Conversely, M&A activity in Europe, the Middle East & Africa (EMEA) and Latin America (LATAM) is expected to fall by 1 percent and 6 percent in H1 2019, respectively. However, despite indications that the M&A market will push higher in the short term, Intralinks suggests that the pace of the current M&A up-cycle, which began in 2014, may have peaked and that dealmakers face considerable headwinds in 2019. These headwinds include a slowing global economy, partly driven by the trade war between the US and China, rising interest rates, depressed global equity markets, increasing nationalism and protectionism against cross-border M&A, and the uncertainty and potential damage to European economic growth caused by the political chaos of the current Brexit process. In terms of Brexit, the Intralinks report examines whether the UK’s departure from the EU is an opportunity or a threat, while noting that UK has been one of the best-performing M&A markets in Europe in recent years – the number of announced deals for UK targets in Q4 2018 having been 41 percent higher than in Q2 2016.